Images of other mammals giving birth can be empowering to the pregnant woman as she approaches the day of her baby’s birth. Observing the birth process as it occurs in these animals connects women to the natural cycle of giving birth as a part of life on earth. During the third trimester of my pregnancy, I regularly watched videos of ocean mammals giving birth. For me, the images of these large mammals giving birth in the calmness of water, especially those of dolphins and whales, made me feel more relaxed about the approaching birth of my child. During some of the more difficult moments of my labor, I reconnected to the images I had watched, visualizing myself as a sea mammal who was opening up to release my child. 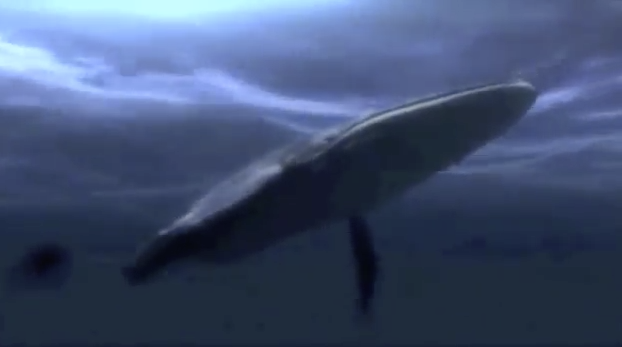 In this short, simulated video, a blue whale gives birth to her calf in the calm, blue waters off of Costa Rica. Moving her body rhythmically, the whale pushes her calf into the ocean. The video is not real, but like any image created in art or nature, this factor does not lessen the way that a woman can utilize the video for her own purposes of visualizing a calm birth process. In her Guide to Childbirth, midwife Ina May Gaskin examines how utilizing visualization of birth as it occurs in the animal world can indeed be a powerful tool for the laboring woman. As she explains, certain animals are known for their coping mechanisms during birth. The pregnant woman can tap into the natural power of these animals by visualizing herself as one of them, assisting herself in her own birth process. Many of us have grown up with the idea that being like other primates in any way is somehow shameful or disgraceful. Given that all other primates are known to cope well with labor and birth, while civilized humans often aren’t, it seems that we would be wise to emulate other female primates as much as possible. My husband has often commented on the similarities between humans and other primates and finds no dishonor in being related to apes. For my own part, I have little trouble thinking of myself as a type of ape, since I often used to imagine that I was a horse, a lion, or a dog when I was a young child. I was usually a horse when I was running and a noble-looking dog (a collie or a German shepherd) when I was sitting in the back of my dad’s car with my brother and sister, bored on the long trip to visit my rural relatives. In labor with my first baby twenty years later, without thinking about why, I reverted to the old pattern and imagined that I was a mountain lion. Emulating an animal made it easier for me to access that power that I instinctively knew I needed during labor. I often suggest to pregnant women that they imagine themselves to be a large mammal when they are in labor. Many say it helps them to find the wild woman within and to tap into the ancient knowledge that is the potential of all women. Ina May Gaskin, Ina May’s Guide to Childbirth, New York: Bantam Dell, 2003, 245-246.